Harris County Railroad Map, 1983. Image available on the Internet and included in accordance with Title 17 U.S.C. Section 107. Texas Railroads Chart. Courtesy of the Texas Transportation Archive. Image available on the Internet and included in accordance with Title 17 U.S.C. Section 107. HARRISBURG RAILROAD AND TRADING COMPANY. The Harrisburg Railroad and Trading Company was chartered on January 9, 1841. According to the original articles of incorporation the railroad had a capital stock of $600,000. The members of the first board of directors were James B. Miller and Alexander Hodge, both of Fort Bend County; James Love and Nathaniel F. Williams, both of Galveston County; and Stephen Richardson, DeWitt Clinton Harris, and Robert Wilson, all of Harris County. 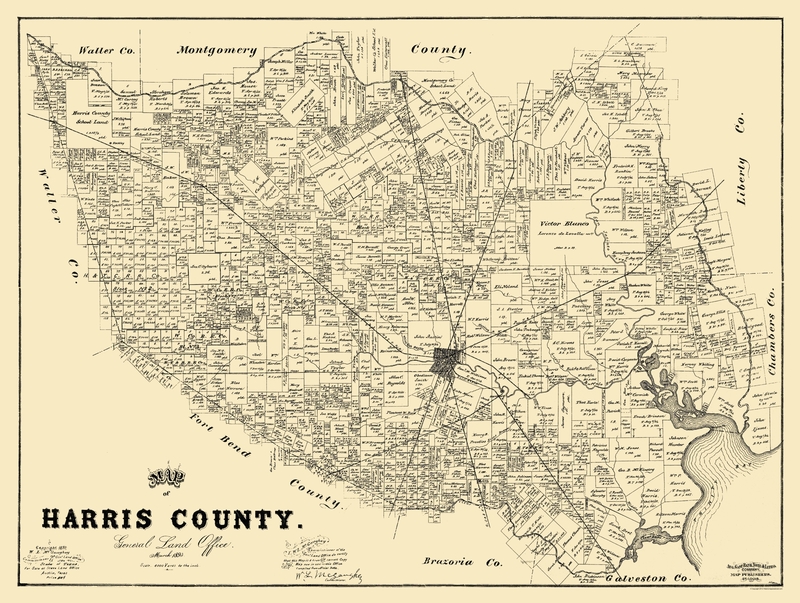 The Harrisburg Railroad and Trading Company assumed the Harrisburg and Brazos Railroad, a private enterprise, and planned to construct a line from Harrisburg to the Brazos River. Andrew Briscoe, one of the financiers of the company and the owner of the Harrisburg and Brazos, envisioned a transcontinental railroad. No banking privileges was granted; construction materials could be imported free of duty; sale of lots in Harrisburg and other towns to be laid out on the route was to help finance the road. Poor business conditions and threats of Mexican invasion probably caused the failure of the project. Two miles were graded before the railroad was abandoned. Handbook of Texas Online, S. G. Reed, "HARRISBURG RAILROAD AND TRADING COMPANY," accessed April 22, 2019, http://www.tshaonline.org/handbook/online/articles/eqh03. Uploaded on June 15, 2010. Modified on March 1, 2017. Published by the Texas State Historical Association.